When we bought the Spitfire, we were already busy getting the TVR cleaned up so there wasn’t much time to dedicate to our little roadster. I did find some time between projects though to prep the engine for its first start in almost 20 years. 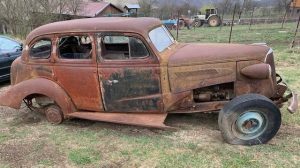 I wanted to chronicle the process here for those of you who may be thinking about pulling a car out of long term storage. 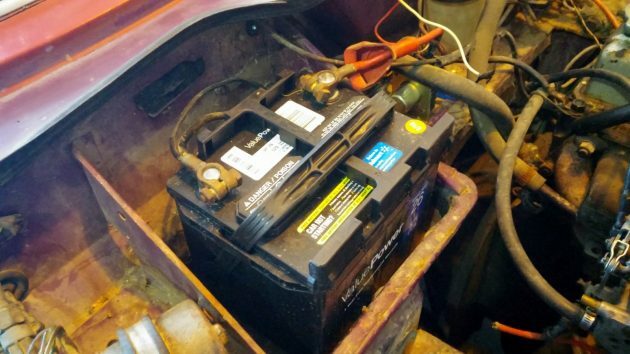 We always cringe when we hear that someone has attempted to start a car that has been sitting for a long time. There are a few things that need to be done before turning that key to make sure that you dont cause any permanent damage. 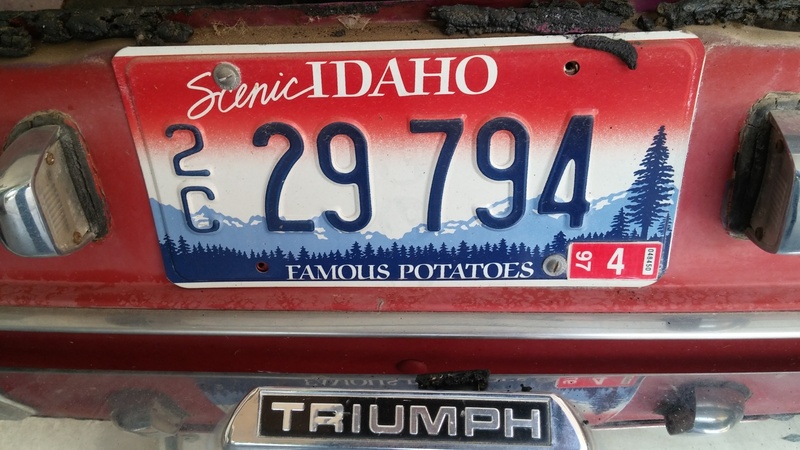 As evidenced by the registration sticker on the license plate, our Spitfire hasn’t moved much in a while. So, our first step was to change the oil. 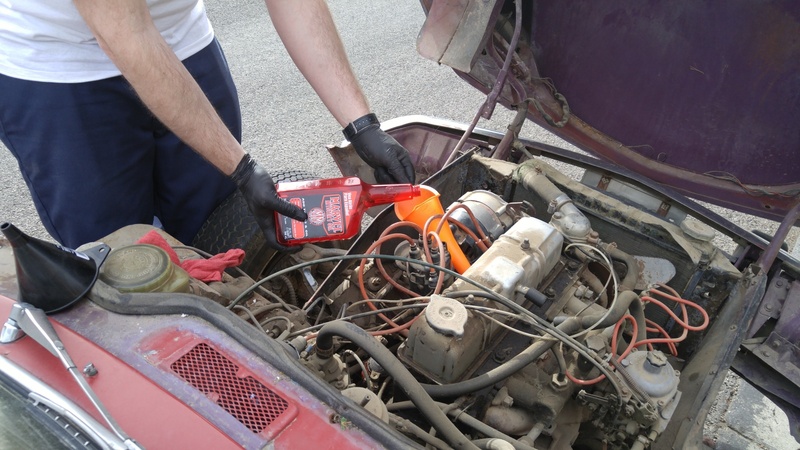 Old dirty oil isn’t very effective at lubricating so we wanted to get all that nasty stuff out of the engine before doing anything else. After that, I pulled the spark plugs and poured a little Marvel Mystery Oil into each cylinder. Our engine wasn’t seized up, but the oil will help loosen things up and provide some extra lubrication during start up. Next on the to do list was to make sure we had spark. Internal combustion engines need 3 things to run – compression, fuel, and spark. The order that you address them isn’t all that important, but you will need to have them all before your engine run. Before testing for spark though, I needed to make sure our electrical system was functional. The previous owner had pulled most of the dash apart so I started putting the gauges back in. While doing that, I discovered that someone had wired in a push button start. The ignition switch had a loose wire, so this much has been someone’s quick fix. After getting all the loose wires hooked back up, I dropped in a new battery and started to look for signs of life. After turning the key part way a dash light came on and I knew we were in business. Hopefully, your project doesn’t have any wiring issues like ours did. After figuring out that I needed to turn the key and hit the push button switch at the same time, I spun the engine over a few times to build up oil pressure and check if we were getting spark. To do this, I just removed a spark plug and sat it on the head with the wire connected. It should spark when turning the engine over. I inspected the wires, cap, and rotor too. Since the engine could turn over with the starter now, I figured it was a good time to check the compression. I didn’t take any photos of the process, but it just requires removing the plugs, screwing in a compression tester, and spinning the engine a few times. Each cylinder showed just over 90 psi on each cylinder. 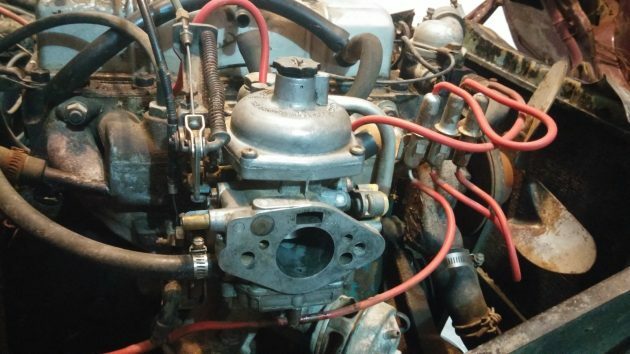 That’s not that great for a 1500 engine, but there wasn’t a huge variation between the cylinders and that is what we are most concerned about. The compression may increase after the engine has run a while anyway, but this will do for now. Now that I knew we had spark and decent compression, it was time to address the fuel system. A quick inspection of the carburetor showed that the old fuel had gunked things up. 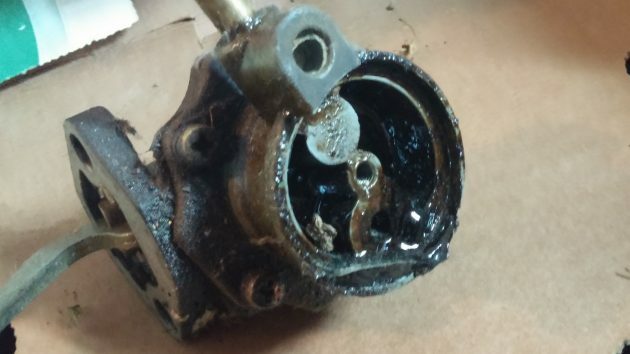 There’s a little piston inside this Stromberg carb that is supposed to move up and down freely, but ours was frozen solid. So, I went ahead and removed the carb to make it easier to cleanup. After taking out the four screws on top, everything pulled apart and I was able to free the piston inside. Then I removed the fuel bowl on the bottom and cleaned everything with some carb cleaner and a rag. After putting the carb put back together and pouring some oil into the dashpot, it was time to check the fuel pump. Our pump has a screw on top that you can remove to get to the filter inside. Well, it didn’t take long to realize that our fuel pump wasn’t going to do much pumping in its current state. It was full of black goo! I probably could have cleaned it up, but luckily Josh had a spare pump laying around from his own Spitfire project. The new pump went in and a hose was temporarily run to a fuel can. I made sure there was coolant in the radiator too. As I anxiously turned the key and pushed the button, I was surprised to hear the engine come to life almost immediately! It shocked me so much actually that I shut it right back down. There wasn’t any coughing or hesitation. It sounded like the car had just been parked yesterday. Our little Spitfire’s heart was pumping once again! It’s still going to need a lot of work before it will see the road, but this first step is always the most exciting. Just be sure to take your time and do it right the first time so your end result is as good as ours! Better (I find) to begin with a penetrant. WD-40 is fine (30-45 seconds in each hole) Marvel (or ATF) is good but won’t get thru fast enough ( a few shots of Marvel or ATF after the penetrant soaks in) Engine rotation should be done forward and backward initially… Put in Third or Fourth gear and rock back and forth. Then when free…commence. The car actually sat for about a week after putting the oil down the cylinders. Thanks for pointing that out. I still haven’t convinced you guys to do a GT6 body swap. I’ll keep trying. I’m asking haven’t any of you guys seen one!? 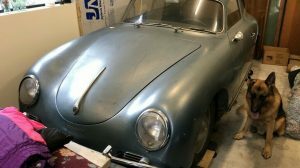 An early car with wire wheels and the GT6 bonnet look so much like an E-type is nuts. I like the idea, but this one has to go for another project we stumbled upon. A Spit 6 ruins the handling of the car. The 6 cylinder ends up with two cylinders ahead of the front wheels. Bad idea. I will plow like an ox hooked up to a yoke. Drove a GT6 for years, plowing is only a problem in an autocross. I think if you check autocross times you’ll find the 6 is still faster. Yep, we didn’t get that far. Nice writeup. Be col to see a few more How-to’s on BF. Welding quarter panel patches, touching up paint, buffing, carb rebuild, etc. All could be good. We will see what we can do Rich. Thanks! Just be prepared to have “the experts” chiming in with the “right way” to do things, as we are seeing above. The wiring issues were our biggest concern here. 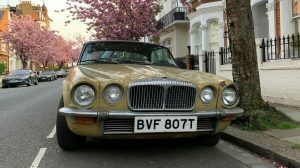 Plus, it’s sometimes hard to know why a barn find was parked on the first place. That is the biggest risk 4 sure. Do you remove the coil wire to keep it from firing when spinning over to get oil pressure? Just a thought. And one could remove all the plugs to make the engine easier to spin over before initial firing. Good suggestions – everyone has their own processes. I forgot to mention that I did remove the wire to the coil when first turning over. Thanks for bringing that up. the best motivation to get a project back on the road is when you know the motor runs. you have more as the white car is a driver while this is not. plus summer is almost here. have fun. 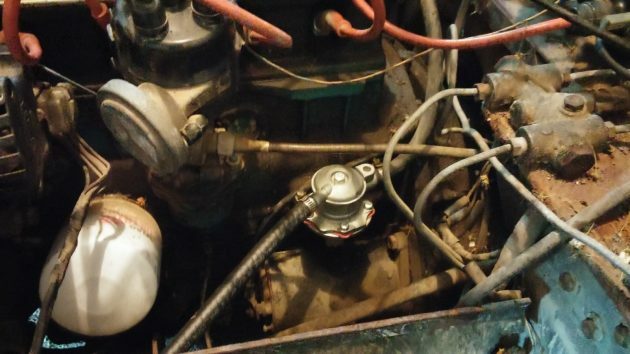 On the Chevy 235 (like the one in my 59 pickup) the oil pump is run by the distributor shaft, and one can remove the dist. and build oil pressure for startup with a large flat-head screwdriver (handle cut off) chucked in a drill. Great “how to” remarks. By the way, I saw an aqua blue ’75 Lincoln Continental Mark IV with matching leather interior on BF some months ago. Could not persuade my wife to agree with me to buy it. Wife finally agreed after some nine months. I called and made arrangements to meet a salesman from Steve’s Hometown Toyota in Ontario, OR. I live in Stockton, CA. I was too tired (26 hour bus trip) to show much anger. Just told him to get out of my way, went back inside the Station, and purchased my return trip home. How could you make a trip like that without at least a deposit on the car………I don’t think you have grounds to be mad at the salesman……. Bummer deal Jose. Should have sent a deposit or something so he would have felt obligated to hold it for you. Well don! I’d like to second the GT6 bonnet swap! i had one in dark blue.. it was gorgeous. Good comments. It is important as you mentioned to lay the spark plugs on the engine so they are grounded. On some vehicles a non grounded spark plug can lead to more problems. I like Marvel for lubing the upper cylinders as long as the motor isn’t stuck. For stuck motors I like diesel fuel. Really does a remarkable job of penetrating everything. And for cleaning gunked up carbs I soak them in Pine Sol for 24 hours. Cleans them right up and you get that “fresh pine scent” after every cleaning. I’ve never heard the Pine Sol technique. We’ll have to try it! 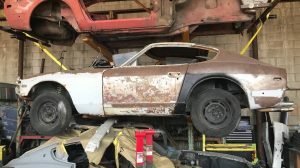 Good information from both sides, my brother in law has a 1993 trans am which has been sitting in the garage for 10 yrs, good tips to assist when we do pull it out and attempt to bring it back to life. Most internal combustion engines like to have air!